Small breasts that lack definition or volume can be the source of anxiety for many women. Breasts are viewed as a common symbol of femininity, and some women feel that their undersized breasts contribute to their lack of feminine curves. Increasing the size and enhancing the shape of the breasts helps many women feel more comfortable and confident in their appearance. The type of implant you choose for your breast augmentation can affect the appearance of your breasts. 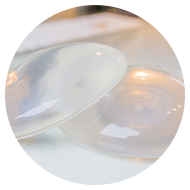 Saline implants are a silicone shell filled with a saltwater solution, and they create a more noticeably augmented appearance. Silicone implants are crafted from a cohesive silicone gel that better simulates the natural look and feel of breast tissue. Your incision location affects the type of implant that can be used during your procedure and the visibility of scarring. The inframammary incision is placed along the lower breast crease. The periareolar incision is created around the outer border of the areola. The transaxillary incision is located in the armpit, and the implant is placed with the use of an endoscope. Your implant placement will affect where and how the breasts fall on the chest. Subpectoral placement creates a more natural breast slope by inserting the implants beneath the pectoral muscle and glandular tissue. Subglandular placement creates a higher breast position by inserting the implants beneath the glandular tissue but over the pectoral muscle. Breast augmentation surgery is performed with the patient under general anesthesia for comfort and safety. Most patients can return to work within two weeks of their surgery. You will be required to limit your physical activities for three to four weeks following your procedure. Bruising can last up to four weeks. Most major swelling will subside within six weeks, and your final results will become visible in about eight weeks. The amount of visible scarring will depend on where your incisions are placed and how well your body heals. Patients do not develop visible scarring on the breasts with transaxillary (underarm) incisions, but periareolar and inframammary incisions will result in scars on the breast. Your body’s healing process will affect the severity of your scars. Any scarring that does develop is likely to fade over time. The cost of breast augmentation will vary based on the geographical location of the surgery, the procedural techniques, your implant type, and the surgeon who performs the surgery. The highest price does not always indicate the best quality of service. It is important to choose a surgeon who is experienced and highly skilled in the procedure you wish to undergo in order to truly get the most out of your investment. According to the American Society of Plastic Surgeons (ASPS), the 2014 national average surgeon fee for breast augmentation was $3,708.